Comfortable 2 bedroom flat located in the heart of Stornoway close to Castle Grounds entrance and only 5 minutes walk to the town centre. Recently refurbished and modernised with smart TV, wireless internet, washing machine, tumble drier, fridge and separate freezer. New high comfort mattresses and blackout blinds along with an updated shower room. Ideal base to explore the island with plenty of private parking outside flat. 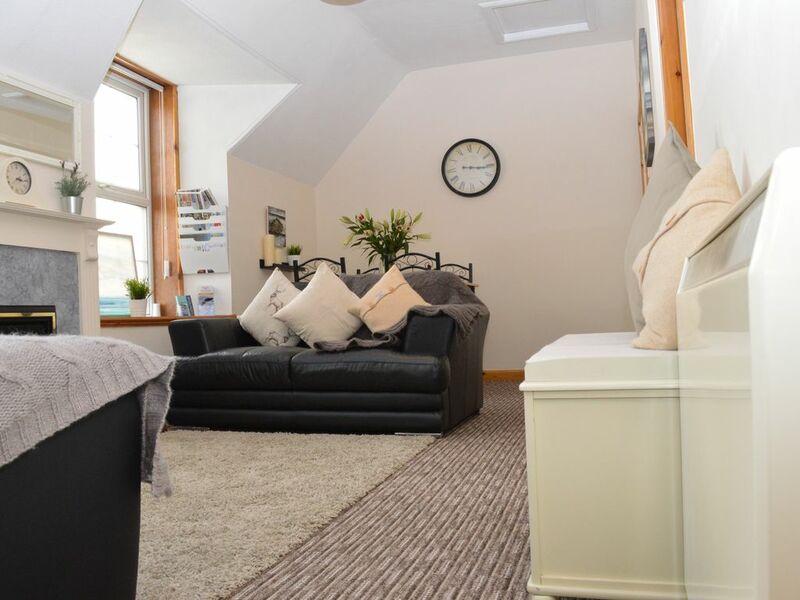 More information The space Our flat offers guests a convenient base to explore the island but yet a central location to enjoy modern amenities. Just 5 minutes walk to the town centre with all its cafe's, bars and shops; 1 minutes walk to the Castle Ground entrance; 10 minutes walk to the museum at the Lews Castle; 3 minutes walk to the Bayhead swing and skate park; 10 minutes walk to the supermarket; and only 3 minutes walk to the harbour. There is plenty private parking at the flat for up to 3 cars but if you have travelled by foot then the ferry terminal is around about 10 minutes walk from the flat. Cooking The kitchen is well equipted with a double electric oven, grill and hob. A modern microwave, kettle, toaster, sandwich maker, and sink with draining board. Full set of cuttlery, sharp knives, pans, oven proof dishes, cooking spoons, ladle, fish slice etc. Dining A dining table and 4 chairs are included in the flat. A baby/child seat is also available with tray for younger guests. Sleeping The flat has 2 bedrooms with the larger equipped with a double bed, dressing table and blackout blinds. The other bedroom comes with bunk beds that are suitable for adults as well as children. All the mattresses have been upgraded to superior comfort models. Livingroom The living area has 2 comfortable leather sofas on either side of the fireplace. A large 42" smart TV with paid Netflix account so hopefully you'll be spoilt for choice on what to watch. Guest access The flat has its own front door and you have full access. Guests can access the property using the security box at the apartment front door which holds the main door key - the code is provided via email prior to your stay. Interaction with guests I am contactable at any time by phone or email and will only attend the property during your stay if requested to do so. Other than that you will have full privacy for your stay. Other things to note There is no meet and greet at the property as we allow the flexibility to check in any time after 3pm.